USIA So I have bought all my Christmas presents as of today, Dec 22nd or whatever it is. (I started last Sunday)... The stuff I got online will not make it. But I will finally be giving my mom and sister their October birthday presents. I'm getting caught up with these things I suppose. But I freakin wrapped up those presents that I've got, lemme tell ya. I am amazed with myself. And now to focus on the wrapping. Gift wrap is dumb. It costs money and is thrown away. And allows little room for creativity. Dulllll. I usually wrap with newspaper or brown paper bags. Then I make baby little snowflakes out of junk mail and tape 'em on. Sometimes life gets fancy and you have colored paper lying around, or sometimes life is classic and pristine and you've got just white. And then write some names up on there with a marker or somethin'. 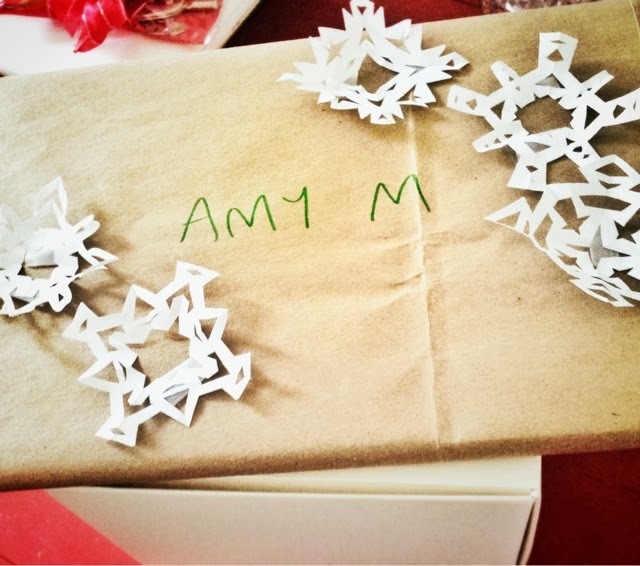 Usually we're on a first name basis, but there are just too many Amy's unto whom I've gotta gift. Thusly I get formal. Oh gosh I hope Amy's like their presents.